Yodelpop is a web design company that puts web strategy at the forefront of every project. Whether you need a brand new site or a refresh / rebranding, we turn your online presence into a living, breathing creative marketing hub.We fully employ the inbound marketing methodology to attract, convert, close, and delight, no matter what CMS you use. This can be done with either traditional web development, which involves the classic project model where the entire site is built in a 3-6 month timeline with a full scope of work, or with the growth driven design model, which is an innovative way of ongoing development that is driven by ongoing results. Keep reading to learn more about growth-driven web design. Your website is powerful tool for creative marketing. Whether you’re a mission-driven nonprofit or a mid-sized ecommerce business, we partner with you to develop a deep understanding of how your goals and your work connect with what your ideal customers and advocates are passionate about. We then create a website that attracts your ideal visitors, converts them to leads, and nurtures those people so they become your customers and supporters. And we have the experience and capacity to work in any content management system as well as Shopify and Shopify Plus, Magento, and other eCommerce platforms. You can see some examples of our web development work here. What is growth-driven web design? Growth-driven design is being used by more and more businesses and organizations that want a website that's launched quickly, updated constantly, and dynamic. 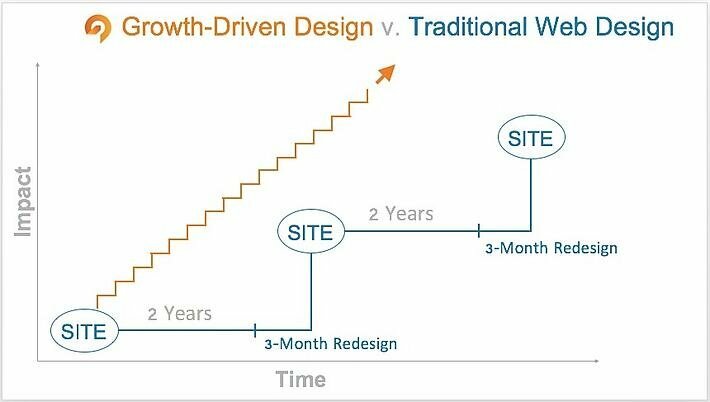 Rather than requiring a long up-front build time and remaining static until the next redesign, their sites are growing and responding to their business needs each month and delivering a constant return on their investment. Growth-driven design is an innovative way of creating your website that shortens the time to launch, is driven by results and increases your ROI. We develop the essentials first — typically about 20 percent of your total site content — and release the "launch pad" site, which gets right to work attracting traffic and converting visitors to contacts. In the coming months, we build the rest of the site — guided by real-time performance metrics combined with your business or organizational priorities. We're constantly measuring performance and making adjustments and improvements to the site to help you reach peak performance. We're also adding content to support your scheduled product launches, events, activities, and campaigns, so there's no scrambling to make ad-hoc changes. As new ideas come up, they go on a wish list, and together we weight and prioritize them according to potential impact. We implement the highest-impact improvements first. 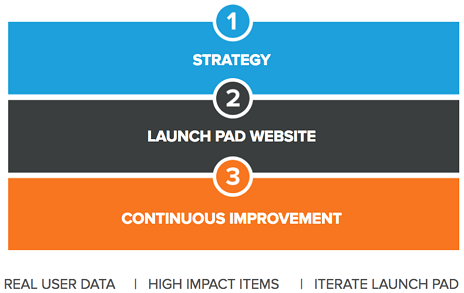 Typically, growth-driven design happens alongside your inbound marketing activities. This allows us to respond to the online marketing metrics we're constantly monitoring by making the changes your website needs in order to be the most successful marketing hub. The budget for developing your site is distributed across 12 months rather than having to be paid completely up-front. It removes the guess work from planning and developing your site. Content is added because metrics point to its potential to improve your marketing performance. It provides data that helps you determine what programs, products, and services you should add, remove, or change. Yodelpop is HubSpot-certified in Growth-Driven Design. We're ready to start building a growth-driven website for your business or organization.